Laura Deming runs the $26 million Longevity Fund – a VC firm dedicated to funding early-stage companies with a high-potential for increasing human lifespans. Her blog has an interesting primer on longevity and the science behind increasing human lifespans. It’s filled with all kinds of well-referenced facts about things that affect our aging and ability to lead long lives. 10 years ago, one of the first projects I worked on was trying to understand a weird fact about reproduction in worms. If you take little worms and get rid of their gonads (I know, it’s weird), they live ~60% longer than normal. But this only works if you get rid of the stuff inside (sperm/eggs – these worms are hermaphrodites, which means they carry around both). If you get rid of the whole thing, lifespan goes back to normal. Don’t miss the 95 things that make mice live longer and 70 drugs in the clinic that might make people live longer sections. If you want to check if you need glasses while sitting at your computer, the above image will help you test whether or not you are shortsighted. 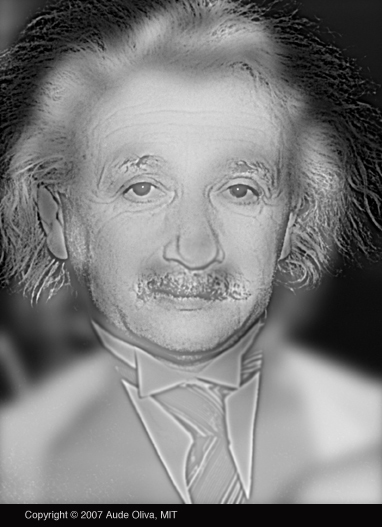 At normal screen viewing distance you should see the face of the great scientist Albert Einstein. This would indicate you have normal vision. Shortsighted people will see Marilyn Monroe. If you squint, or move a few meters away from your screen (replicating having short-sighted vision) you will see Marilyn Monroe. The other day a few people asked how it is that I got to smelling like cookies. Your answers can be found with this soap and this shaving cream. Local Harvest will help you find farmers’ markets, family farms, and other sources of sustainably grown foods in your area. Slate published an article this week that watching television causes autism based on research done by Cornell economists. This scared the crap out of me so I decided to find out my autism quotient. I ended up only getting a 15, which is on the low end of average, and better than most males. As a result, I’ll be watching the Project Runway finale tonight. It’s been a while since I’ve posted a ‘here is what I did and this is how I feel about it’ post, so here goes: Nothing and very little. It’s been a fairly stressful last week and a half and the lack of sleep combined with an emotional rollercoaster ground me down, and that has allowed the sickness to creeeeeep in. I took a couple days off work last week and have spent most of my recent evening laying on the couch and the switching over and laying in the other side of the couch, this, so I can breathe out of each of my nostrils alternatively. The last three or four nights I’ve gotten little sleep due to a persistent dry cough that throws me into REM shattering convulsions. Other than that I’m doing great though. I did go see the doctor today though. I normally wouldn’t go to the doctor for a mere cold, but this has gone on for over a week and I’m my sleep debt is increasing to a level I’m not comfortable with. He prescribed me some codeine lace cough syrup. I hope this helps. I also discussed with him this issue. He’s doing some blood work but suspects it’s my endocrine system, which has effectively failed me since I was 15 years old, and may be the reason for low blood sugar and also connected to why I’ve been getting sick so much lately.